Korea is a small country. That means a very limited audience. Therefore, a marker of success for an animated property is its ability to sell internationally. Pororo the Little Penguin is one such success story. Korean made characters are in a minority group in the local character goods market place. You are much more likely to see characters from the United States or Japan featured on both television and on products. The Korean characters that do exist are rarely ever anybody's favorites. However, Pororo is everywhere. He's on wristwatches, is a stuffed animal, even multiple bootleg DVD's are easy to find. There are over 400 Pororo based character goods. He's successful locally and he is exported to over 82 countries. What has made Pororo stand out? One important thing is that people genuinely like him in the first place. 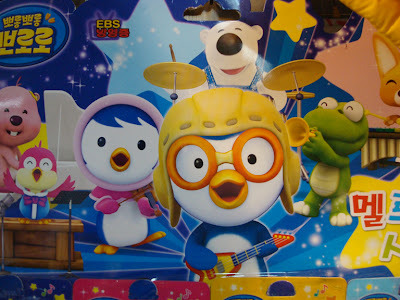 But what is it about Pororo that stands out? Perhaps it's just his cute design. Or perhaps it is his adventures. Choi Jong Il, the CEO of the company that makes Pororo explains, "The secret of Pororo's long-running popularity may well be its empathy with today's children." (taken from the KOCCA website) Nothing seems super exceptional about the story to me. I do find the character designs appealing and the animation to look quite good (by the way, I learned at the Animation Museum that Pororo was co-produced in North Korea). 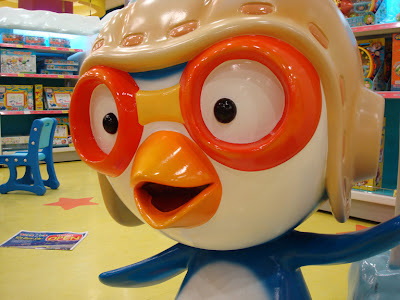 There is nothing distinctly Korean about the look of Pororo. Even the name given to the little penguin seems to blend in with other international hits--think Keroro (Japan) or Pocoyo (Spain). His culturally odorless design must be intentional. And this has proven quite successful. Pororo was a big hit in France and also found success in Italy, Japan, China, and Latin America. Have you seen Pororo in your part of the world? What do you think the secret to his success is? I'll stick to my theory that penguins are just irresistible. How long has Pororo been around? What about Pucca and her unfortunate "boyfriend" Garu? They have a show on U.S. TV. I own the stuffed dolls i got that was part of a promo at Lotteria. Ween! Ha ha! I don't think a penguin gift will hurt anything! Pororo has not been around that long, less than five years I think. Hello Adrienne. Yup, Pucca is one of the other big current character good hits in Korea. It's a big deal for Pucca to be on television in the United States, too. Unlike Pororo, Pucca started out as merchandising and then became an animation (sort of like Hello Kitty). You can read more about Pucca in the #4 link at the bottom of my post. They had a promo at Lotteria? I didn't know! Thanks for visiting this blog! This blog is quickly becoming a favourite. Such fun commentary! Thanks for the encouragement, Daniel. I didn't know that about Keroro, ha ha! I watched him for season 1 before or around the time that March of the Penguins came out. He's loveable because of the his character and all the other characters. That being said, it is hard to get any Pororo goods in Canada. Chiigua, I'd say just wait and you'll probably see more Pororo goods. He's big in France! I have an obsession with Pororo. I've been waiting since early 2004 for more Pororo goods. Actually Christmas 2006/5 you could find some stuffed Pororo dolls (but only from the first season characters)... I wish I had gotten that Eddy! I think they are semi popular in Japan because they have some finger puppets you can get from the coin machines.. I bought 9 to try to get the whole set but without any luck. Seriously... I want to take a photo with that Pororo. Ha ha, Chiigua! If it's Pororo goods you are looking for, maybe you should come over to Korea! Or maybe France. . .